Several open events are run in conjunction with other Chichester Harbour and Solent sailing clubs. The season starts at the end of April and runs through to the end of October. Most weekends there is racing on both Saturday and Sunday with the first start scheduled for late Saturday morning. Most starts are from a committee boat in the vicinity of Chi, Hard or W-E racing marks positioned just west of the Chichester Bar beacon. Trophies and points are firstly awarded for individual races. Most races are then either part of “Passage Season Series” or “Bay Season Series; or they may be part of a mini-series run over a weekend. The important part is that there are many opportunities to win! 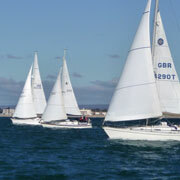 Round-the-cans races take place in Hayling Bay finishing back at Chi, with a second race on the Sunday. Passage races usually head west via various marks to a Solent destination, with a return race on the Sunday. A social event, usually at a local Sailing Club, is arranged for the Saturday evening. Hayling Bay is excellent for racing – sheltered, with plenty of racing marks, moderate yet interesting tides, and no shipping! CCRC is affiliated to the RYA, so all races are in accordance with the Racing Rules of Sailing. Compliance with ORC category 4 (3 for cross-Channel races) is recommended.